Our great network of partners is producing some amazing projects and tutorials, like the remote weather station tutorial by WolkAbout that uses both the Zerynth tools and the XinaBox hardware. The WolkAbout team published it on hackster.io, and if you start reading it you’ll see that they have used our remote weather monitor example. Visit our docs to see the full example and browse the Example section of the documentation, perhaps you’ll find something you want to try out today. 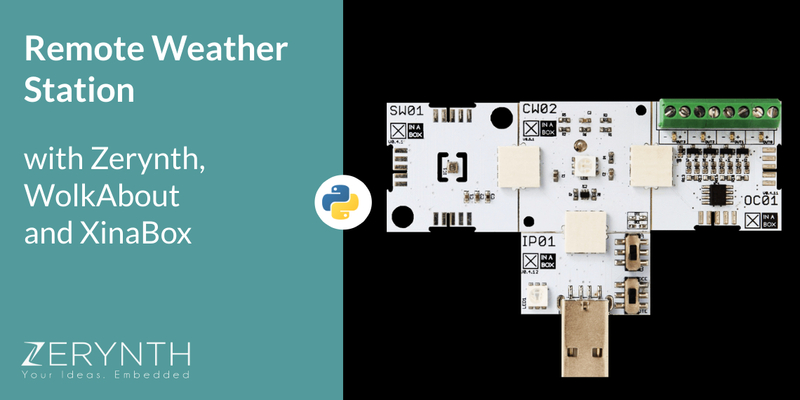 So by following the tutorial, with XinaBox versatile modules and WolkAbout’s innovative IoT Platform, you’ll get to create your own remote controlled weather monitor. The BME280 environmental sensor used here will give you accurate ambient temperature, humidity, and pressure data, which will then be sent to the WolkAbout IoT Platform. As you already know the CW02 has a Zerynth license onboard. All you need to do to activate it is enter the Voucher Code at the moment of the registration of the board and your license will be activated. Like everything we do, it’s easy and simple. To learn more, read the article where we explain in detail how to redeem the code. Now all you are left to do is enjoy your new remotely controlled weather station. Set it up in your living room, and you’ll always know what’s going on in our house. Leave it somewhere by the lake, and wait for those perfect fishing conditions. Make one for the office, or whatever else you like. We hope you found this tutorial useful, and that you are ready to download Zerynth Studio and start your own IoT project. WolkAbout is a Czech IoT company which main product is WolkAbout IoT Platform. This scalable IoT application enablement platform allows users to easily and securely connect, manage, monitor and control disparate devices, transform real-time readings into meaningful data and combine different devices and services into a complete IoT solution. XinaBox’s flagship product is a range of 70+ modular xChip, which include cores/CPUs, sensors, power, communication, output, and storage, using a connectivity standard without wires and soldering, breadboards or hardware knowledge.